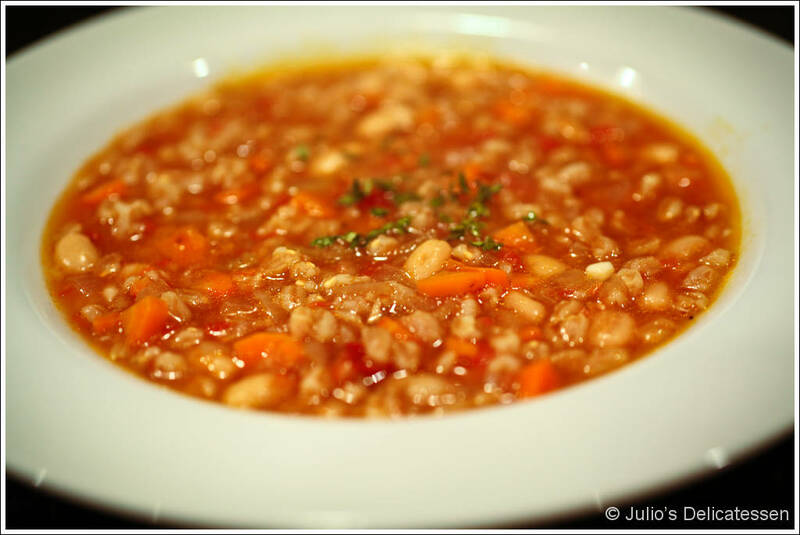 Over the last few months, recipes and menu items including farro have been popping up everywhere I look. I wanted to try cooking with it, and this soup from Tuscany provided the perfect cold-weather dish in which to do so. Unlike most other grains, the farro is difficult to overcook and won’t get mushy if it simmers a little longer than necessary, making this a quick, easy, forgiving soup. Heat some oil in the bottom of a heavy-bottomed pot. Add the onion, celery, and carrots, and season with salt and pepper. Cook until the vegetables begin to soften – about 8 minutes. Add the garlic and cook another 2 minutes. Add the tomatoes, beans, farro, beef stock, boquet garni, and enough water to cover everything. Bring to a boil and reduce to a simmer. Simmer until the farro is tender – about 45 minutes. Add more water as necessary. Remove the boquet garni and serve. If you have leftovers, you may need to add additional liquid when you reheat, as the farro will absorb the broth in the fridge. Made this in the slow cooker tonight. It was great to come home from a chilly baseball practice to have this ready for dinner.